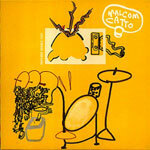 Malcom Catto is the newest face to launch himself headfirst into the lo-fi scene with an instrumental album, just short of an hour's listening and boasting fifteen tracks. For those interested in his past he established himself as a drummer a few million years ago before joining the Soul Destroyers, a retro funk band. For those of you interested only in the present and the music then read on. 'Velvet' is a warm, but very short mix of electronica and gentle jazz. 'Fax' opens deceptively with a dub-style drum beat which later resurfaces beneath an odd array of instruments each going in their own direction, but still fitting into the song as a whole. The piano adds melody while the loop on the keyboard brings tension and a sense of insecurity. 'Spaghetti' boasts a massive fuzz-bass line but it is buried too far in the track to really grab hold like it should. 'Raydid' is a jazzy little number that is based around a freestyle, improvised ostinato. One of the best tracks on the album has to be 'Vibes'. At just over three minutes long it brims with tension and suspense. You can almost hear it begging to be used in a spy-flick, and it easily could with the mood that radiates from it. Towards the end it slides gently into what sounds uncannily like the theme to Dr. Who for a few bars. An outstanding piece of genius. While the songs are generally short but there is so much going on in them that the overall feel of the album is a kind of a blink-and-you'll-miss-it type one. At times this very full on approach, while interesting, can be too overpowering with the whole song getting lost in the fuzz and leaving nothing solid to stand on. This album is the result of a year in the studio but you are left with the impression that if he hadn't put so much into some of the songs they would probably have worked a bit better.